Erimama Investment Company Ltd is a wholly Nigerian company fully involved in the manufacture of premium portable cabins, steel buildings and prefab homes. The goal of this web site is to provide free Nigeria portable cabins and prefab building information to potential customers so they get factual and practical prefab building information at their finger tips. And, therefore, make the right selection of products when buying from us. Erimama Investment Company Ltd, the owners of this web site, currently have two directors. Our MD & CEO is Samson Itoje . . . a young, vibrant, resourceful and honest businessman. 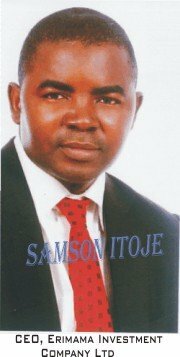 Samson Itoje is passionate about customer satisfaction and quality delivery. That is why our company focuses on using the right materials and skilled people to deliver quality portable cabins and prefab buildings to customers all over Nigeria. Our second executive director is Mrs. Ngozi Ruth Itoje . . . a pragmatic business woman with incredible intuition, passion for solving problems and divine wisdom. Mrs. Ngozi Ruth Itoje comes to the business with sound business skills and a burning desire to meet customer requirements and therefore keep our customers happy. At Erimama Investment Company Ltd our focus is simple . . . To build high quality portable cabins and prefab buildings for customers at cost-effective prices. If you desire to buy or build high quality . . .
. . . or any other category of prefab house (or steel building) at pocket-friendly price, then you should contact us right away to discuss your portacabins or prefab building requirements. Alternatively, you can simply request a quote. We strongly believe in rewarding people who help us grow our business. In fact, this is a key business philosophy at Erimama Investment Company Ltd.
We believe in this concept so much that we actually dedicated an entire page on this web site to help our independent marketers (or affiliates) understand how our reward system works. This means that if you recommend a customer to us and the customer makes a purchase, we reward you financially. If getting paid for recommending our service sounds good to you, click HERE to learn about how we reward our affiliates. Click HERE to send us an email or to get our phone numbers and speak with one of our customer representatives.